Ulster Bank Rugby Ambassador Stephen Ferris presents Banbridge RFC full back Adam Doherty (right) with the �2.5K prize for his club at Sunday's Ulster Bank 'Drop-Kick for your Club' event at the Aviva Stadium in Dublin. Banbridge RFC full back Adam Doherty took part in Ulster Bank’s ‘Drop-Kick for Your Club’ initiative on Sunday. Adam took to the pitch during half-time of the Ulster Bank League final between eventual winners Clontarf and Cork Con, at Dublin’s Aviva Stadium and secured £2500 for his rugby club. Four nominated kickers who were representing their clubs, one from each province, were given the opportunity to take a 32 metre drop-kick for the chance to win the top prize of €10,000. Despite all four missing the target, each club took home prize money to help improve club facilities. The three other kickers were Simon Gillespie from MU Barnhall RFC in Kildare, Declan Bannon from Bruff RFC, Limerick and Ross Keller from Ballinasloe Rugby Club in Galway and they each had just one chance to attempt the kick. 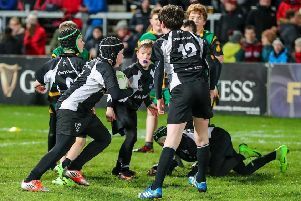 The first year of initiative which was launched last month saw 168 entries from rugby clubs all over the island of Ireland as Ulster Bank continues to show their support for grassroots rugby. Marc Eadie, Hon Secretary at Banbridge RFC said the club was delighted to be part of this new and exciting challenge, “Ulster Bank’s Drop Kick for your Club is a brilliant competition for our club to be involved in and our player Adam Doherty had a superb day in Dublin. “The club continues to develop and upgrade facilities year on year and monies raised through this fantastic challenge at the Aviva will help us roll out our five year development plan at Banbridge. “Improvements planned include new ladies and gents toilets as well as enhanced gym and changing facilities plus physio and referee facilities. “We’re also planning to replace our internal lighting systems to LED providing a more environmentally friendly and cost effective solution for the club. For more infor visit Ulster Bank Rugby’s Facebook page.